Poway Healthcare Center is the premier skilled nursing facility in Poway, California. 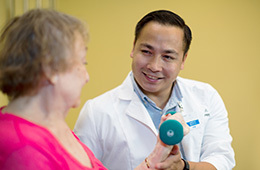 At Poway Healthcare Center we focus on a smaller more personalized level of care. We provide therapy focused on the individual which allows our residents the opportunity to make greater strides in the advancement of their health. Our guiding principle is to provide outstanding and innovative healthcare in an environment that remembers the importance of the individual and family. Our staff of dedicated professionals embodies the values that we cherish most – a nurturing spirit and a commitment to quality. Visitors are welcome every day of the week. Come see our residents and friendly staff in action. Please contact us to learn more about the unique, sophisticated healthcare environment at Poway Healthcare Center.